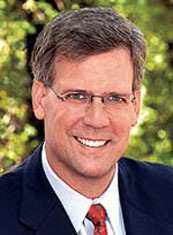 Tony Snow had spent more than half his life being paid to express his political opinions, before taking "a massive cut in pay" to become Press Secretary for President George W. Bush. He started in the news business writing editorials for The Greensboro Record in Greensboro, North Carolina, in 1979. He wrote editorials at the Virginian Pilot newspaper in Norfolk, VA from 1981-82, then at the Newport News Daily Press from 1982-84. He was deputy editorial page editor of the Detroit News from 1984-87, when that paper was famous for its far conservative political perspective, and then became editorial page editor of Moonie leader Sun Myung Moon's Washington Times. He worked as a speechwriter for Bush's father, President George H.W. Bush, in the early 1990s, then wrote a regular column for USA Today. In 1996 he was hired by former Republican campaign operative Roger Ailes to host FOX News Sunday, and in 2003 he began hosting a daily radio talk show, syndicated by Fox. He joined the Bush administration in 2006, but on the last day of August 2007 he announced his resignation as Press Secretary. In his punditry, Snow had a somewhat tenuous relationship with truth, making numerous false statements over the years without issuing subsequent corrections. He claimed, for example, that evolution is not verifiable (while normally too slow a process to be noticed, it has been observed in microorganisms, as well as mussels of the Eastern Seaboard), that Senator John Kerry had criticized US troops in Iraq, that Iraqi girls did not attend school while Saddam Hussein was in power (utterly false), and that Valerie Plame was not a covert CIA operative (despite disinformative claims to the contrary, the CIA considered Plame covert until the time of her outing, and because of this, initiated the investigation into the matter). Snow described the Guantanamo prison camp as "the most humane prisoner-of-war facility in history." When some Democrats objected to Bush's extralegal wiretapping of Americans without the Constitutionally-mandated warrants and oversight (in violation of the FISA law), Snow took the lead in characterizing Democrats as wanting to protect al Qaeda from intelligence eavesdropping. Friends said Snow was a George McGovern liberal when he came to college, where he was known in the 1970s as the longhair with a penchant for playing the Jethro Tull tune "Aqualung" on his flute. By the time he graduated, he had evolved into a Ronald Reagan Republican. He met his wife, the former Jill Walker, when she worked as a secretary at the Detroit News. Snow was a long-time member of the Council on Foreign Relations, a well-connected foreign policy think tank whose membership includes DC insiders from Madeleine Albright to Mort Zuckerman. In his spare time, he played flute, sax, and guitar, and occasionally performed with a band that called itself Beats Workin'. In 2005 he was diagnosed with colon cancer, the disease that killed his mother while Snow was still in high school. He received chemotherapy and had his colon removed, its function taken by a surgically refashioned small intestine. He publicly maintained that he had received a clean bill of health from his doctors, but died on 12 July 2008 as his cancer spread to other parts of his body. Georgetown University Hospital, Washington, DC.